The Kurdistan Regional Government (KRG) Council of Ministers has agreed to allow the Ministry of Health to reduce the proportion cut from the salaries of health employees under the salary saving system, a spokesperson for the Ministry of Health told Rudaw. “We as the Ministry of Health have been asked to prepare a proposal for reducing the saving [percentage]. We will formulate this proposal so as to be in the interest of all the employees of the Ministry of Health. The saving ratio will be decreased to as minimal as possible so that this salary is given monthly. The [financial] incentive will also be reimbursed this week,” Khalis Qadir, the health ministry spokesperson, told Rudaw. The health official said its proposal will be ready in two days and will be sent to the Council of Ministers. The Kurdistan Regional Government (KRG)’s Council of Ministers issued a statement on Sunday afternoon saying it will adjust the salary saving system if Baghdad continues sending funds to Erbil. It said ministers understand the difficult circumstances of the KRG’s salary takers. “As we had decided prior to Newroz to hold a special meeting concerning the salary saving [system], today on March 25, a meeting, attended by the Kurdistan Region’s prime minister, the deputy prime minister, and the ministries of health and education and other relevant sides was held,” reads a statement published by the KRG. “If Baghdad continues sending funds, which amount to 317 billion Iraqi dinars, which is a small amount, the Kurdistan Regional Government, with the oil revenues and internal revenues, will adjust the salary saving [system] in a way that serves the interest of Kurdistan Region’s salary takers,” the statement reads. The Ministry of Finance and Economy is to prepare a new schedule for salaries in the coming days for the Council of Ministers to ratify. “The Kurdistan Regional Government, in the upcoming days, will disclose all of its revenues from internal, oil, funds from Baghdad and American help for the Peshmerga and for which they have spent,” the statement added. The KRG statement comes amid mass protests across the Kurdistan Region, from Sulaimani, where people have set up a camp in front of the city courthouse, and Erbil and Duhok. The Iraqi government said it would pay the salaries of the KRG’s health and education ministries in full. Under a deal between Erbil and Baghdad, however, the funds were instead earmarked for all KRG ministries, whereby nobody would get their full salary. Riot police used tear gas to disperse protesters at Erbil’s Shanadar Park when the crowd tried to move demonstrate in front of the Council of Ministers. There have been reports of at least five people injured. Rudaw’s Sangar Abdulrahman, reporting from the park, said that no government officials had come to address the protesters, but MPs from opposition parties – Gorran, Kurdistan Islamic Group (Komal), and Kurdistan Islamic Union (KIU) – were among the protesters. A planned protest for Monday has not yet been granted official approval. A protester shows a tear gas canister to Rudaw's camera at Shanadar Park. The Erbil branch of a doctors’ syndicate, staging a “gathering” on Sunday, threatened to escalate their action to protests and strikes if their demands are not met. Their demand is payment of their salaries in full – arguing that they can accept reduced wages from Erbil as part of the Kurdish struggle, but they cannot accept it from Baghdad. "As a group of physicians along with the Kurdistan Doctors Syndicate-Erbil branch, we have staged a gathering. We support the just demands of the doctors for one hundred percent of their salaries to be given," said a representative of striking health workers in Erbil. Health workers have worked for the Kurdish cause and so have accepted the situation as the Kurds build a state, but as long as Kurdistan is part of Iraq, they must be a full partner, the representative said. “We will not accept them considering us as number two in Iraq. They must count us as the people of Baghdad and Basra." The KRG introduced the salary-saving system when it faced a financial crisis caused by several factors, including full cut of payments from Baghdad, low oil prices, and the costly war with ISIS. With the new agreement with the federal government, initial expectations were that Baghdad would pay KRG civil servant salaries in full and not the reduced wages of the austerity measures, beginning with the health and education sectors. The first payment however, was distributed among all sectors and under the saving system. The health workers said that they are “ready to sacrifice our heads and life” if it is for Kurdistan. “But as long as we are part of Iraq, we will in no way accept it." "Our rights must be given in full," the spokesperson urged. "Otherwise we will ask for our rights in a democratic and civil way." "We have staged a gathering now. We will expand it to protests. If necessary, we will go on strike," he concluded. Protesters in Sulaimani are setting up camp in front of the court, determined to remain until their demands are met. "Starting from today, we will begin a new civil struggle by staying in the streets and we will close down these streets during the nighttime just to tell people that our dissatisfaction has reached the limit,” said an angry protester. Striking civil servants have set up tents in front of the court, asking the public prosecutor, as a senior legal authority, to take their demands to the government. "We have been protesting on the streets for three years now," the protester said, adding that government institutions "have failed" as they are unable to respond to the demands of the "exhausted" teachers and civil servants. Huge crowds have taken to the streets of Sulaimani on Sunday, protesting salary cuts and corruption. “We are against all oppression. We are against all corruption,” read signs in Sulaimani. Protests have also spread to Erbil and Duhok, for the first time. Chanting teachers in front of Erbil’s Shanadar Park declared they will not return to class until the salary-saving system is cancelled. They said they were at the park because they were prevented from protesting before the parliament and the Council of Ministers. Despite the "tough situation the teachers were going through," they have not stopped teaching, a representative read from a statement of the striking educators. "These attitudes and stances showed by the teachers must be thanked and appreciated" by the KRG, the statement continued. Addressing the government, the spokesperson said, "As teachers and civil servants from Erbil, we are calling on you to revise the salaries of the employees without the saving system." The KRG must also "seriously save the education system of the Kurdistan Region and work to protect the dignity of teachers." They announced their intention to visit the parliament and Council of Ministries to present their demands as representatives of the teachers, and vowed to continue their strike until their demands are met. Some physicians and health workers from the Nanakali Hospital in Erbil have also joined the general strike. Announcing a strike, staff at Erbil’s teaching hospital have given the KRG 72 hours to lift the salary-saving system. Their planned action will not include essential services, staff stated, but if the KRG fails to respond, then they essential services at the hospital will join the action. Under increasing pressure, the government’s Oil and Gas Council will meet on Sunday to review the salary-saving system. Prime Minister Nechirvan Barzani, Deputy Prime Minister Qubad Talabani, and most cabinet members will attend, Rudaw’s Sangar Abdulrahman reported. Their meeting is advisory only, and cannot make any decisions – that can only be done by the Council of Ministers, which originally devised the system. 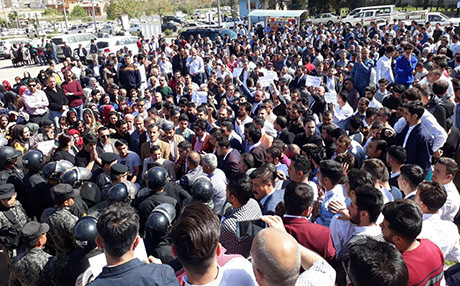 Health workers and teachers in Erbil, Sulaimani, and Duhok protest the salary-saving system implemented by the KRG as part of its austerity measures.